Shoe looks and fits great!!!! Looking for more colors in this shoe. Shoe fits true to size. I own 4 of the 6 colors that released and these were hands down the best looking pair. Jeans, khakis, it looks great. I absolutely love these shoes. Comfy and stylish. I get compliments all the time from my college friends! I am 70 years old. I have a long low volume foot and can't stand anything touching my toes. These Chukas are perfect. They are unlined light weight and terrific to walk in. I find them very attractive. I would definitely buy again. I have been a pretty loyal customer to Cole Haan's dress shoes. Give them at least 3 full days of wear before you realize the true comfort of this shoe. Take a break for a day after each day wearing them and I would recommend shoe trees in them at night to stretch the leather a little bit more. Overall, fantastic shoe and the white base gets tons of compliments on being hip and unique. Perfect shoe for business casual dress and also great with jeans. Excellent investment. These shoes are worth the spend. Great shoes - love them! I understand Cole Haan has a relationship with Nike. I suspect this is why he loves the fit and feel of these shoes - very nice shoes! Most comfortable shoes I’ve ever owned. And the classic style is so too bad either! Look and feel is consistent with the rest of the line. No break in needed, instant comfort with these shoes. Light on the feet, classic look with some flare. I get many compliments on these shoes. They are versatile & comfortable. Also, they are not a shoe that everyone has, so I like their uniqueness, while looking very stylish! 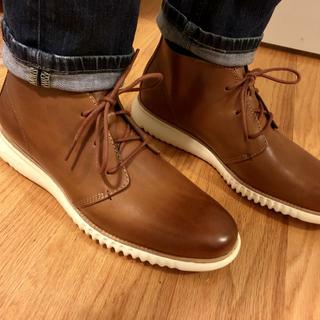 The zerogrand chukka was exactly what I was looking for - looks great, fits well, warm, and comfortable. I've loved Cole Haan Chukkas for about 3 years now. This is my first experience with the 2.ZEROGRAND, as I've only owned Original Grands until now. The craftsmanship and fit are very similar to the OG, meaning they get top marks from me in those departments. The only thing keeping me from giving a 5th star is there is a pronounced heel raise in the 2.ZEROGRAND that takes some getting used to. Perhaps this is extra cushion and it will end up extending the life of the grand sole. Other may like this feel, but I prefer the more level feel of the Original Grans. I would still recommend these to anyone, with the caveat that the heel feels slightly raised. I wore them all weekend on a trip recently, and still very comfortable. Looked like my milkshake ones! I like the look for casual wear. You can wear it on with jeans and khakis. It's a good look. Looking forward to wearing it. I have the exact pair from last year. Like them so much I wanted another pair. Perfect boot for casual Fridays! Awesome boot. Warm/comfortable/ lightweight and stylish. I buy Cole Haan for style and comfortability as I'm constantly on my feet and always moving. Nice color and I only wear Cole Haan shoes. They are comfortable. Great sale price too. My husband already owns another chukka style from here and absolutely loves it! Got this one because it's a different color and slightly different style/sole. Great walking shoe - comfortable and looks great. Never had Chukka's - wanted to give them a try. And they're Cole Haan. Great Shoes, Great Price -- had to have them. I'm walking a lot and I need the extra support around my ankle. I thought these were perfect for my need and the price was right on a quality pair for boots. They look fresh and the reviews say they are super comfortable. Great looking shoe and it's Black Friday prices. Come on! What’s the best way to clean Men's 2.ZERØGRAND Chukka? BEST ANSWER: For smooth leather styles, wipe with a soft, slightly damp cloth to remove surface soil. When completely dry, apply complementary color polish to cover scratches and/or scuffs. You may also occasionally apply leather conditioner according to manufacturer directions. For soles, our Grand Sole Cleaner is specifically designed to clean the soles and edges of rubberized footwear. Packaged in an easy to control fingertip pump spray, the product will help clean both oil-based and water-based stains. Use Cole Haan’s Leather cleaning and conditioning lotion. Don’t use any water on the leather, you can use warm water and a little soap with a towel/cloth to clean the soles. Are these storm welt and can you resole at a cobbler? or once the rubber wears are they are done? BEST ANSWER: The shoes are not storm worm welt. The stitching texture you see at the widest portions of the shoe are not real. They are only textured to imitate stitching, and the texturing doesn't continue around the toe or under the arch of the shoe. I've never had a pair of my shoes resoled, but I have a hard time believing that the composite/foam/molded EVA sole could be replaced. BEST ANSWER: No, however apply Cole Haan Leather Protector spray (available in stores) to provide water resistant protection. Or,visit our Weatherproof section to view other chukkas and boots that are waterproof. Every pair of socks I wear with these get dyed around the toes by the leather. Is there anything I can do to prevent this? BEST ANSWER: What you are seeing is not unusual - and Stephen's answer is correct. Some leathers are tanned using vegetable dyes - a more delicate process than chemical tanning that leaves the leather with a softer feel. When these leathers come into contact with skin or heat (perspiration) they tend to release color for a period of time. This happens with shoes and also handbag handles. It will dissipate over time and the color should come off the skin with regular soap and water. Try shaking a bit of foot powder into your shoes before wearing. This will help to absorb moisture. You can try an insole, but I had the same issue myself. What is the difference between the 2.zerogrand chukka and the original Grand chukka? BEST ANSWER: The 2.ZERØGRAND Chukka is a slightly more athletic, innovative edition of the OriginalGrand; the biggest difference being in the outsole. Both have fine leather uppers and Grand.OS foot bed technology. 2.0 has 3 sets of eyelets while OriginalGrand has 4 - slightly more dressy look. For particular details, please see the description on the product pages. Can these be resoled like redwings? maybe time to start looking for other brands/options. BEST ANSWER: This style was made in size 13, however, because it was a Fall 2017 style, all the 13s are sold out online. No worries, though - this style was also sold by many of our retail partners. Do an online search for "Cole Haan Men's 2.0Grand Chukka". Good luck! BEST ANSWER: If you take a look at the thumbnail picture of the sole on the product page, you'll notice the ribbed texture and the toe and heel pods. These are great features not only for traction, but also for lightweight flexibility.